Blazons without visual shield/designs are in the works. or the O.P. 's of other Kingdoms. Contact me to forward corrections or with name/spelling preferences. This will facilitate repairs to the O.P. while recognizing Awards given. Contact me to forward corrections. Argent, on a cross fleury purpure, a rose argent. the sword hilted Or, in base a standing balance Or. the sword hilted Or, in chief a compass star argent. between three Latin crosses counterchanged. sustaining a Latin cross bendwise, counterchanged. Per pale vert and sable, two pegasi combatant argent. a bend counterchanged and in sinister chief a cross of Santiago vert. two lions passant guardant gules and a sword argent. Quarterly gules and sable, in bend two griffins Or. 2 compass stars elongated to base vert and a thistle proper. 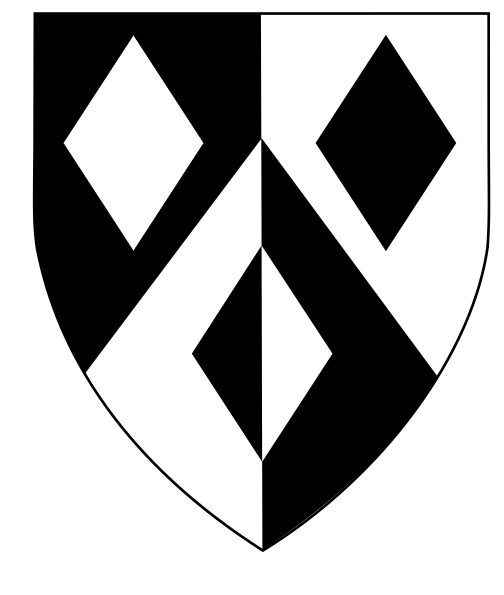 Per pale and per chevron sable and argent, three lozenges counterchanged. 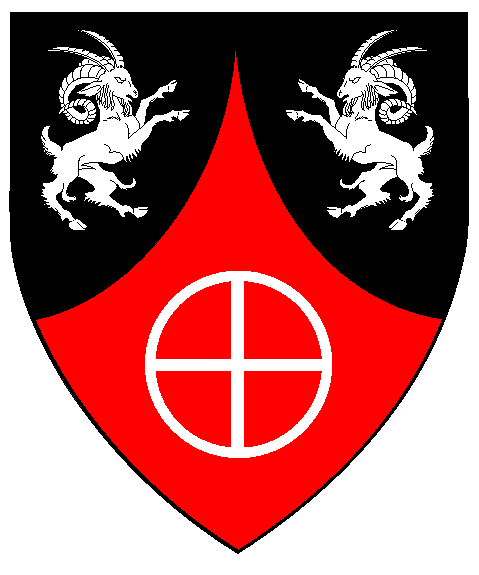 Argent, a sun sable, on a chief gules a demi-lion erect issuant argent. Or, flying three pennants, overall a bear counter-passant argent. armed Or, clutching a wild rose proper [Rosa sylvestre]. charged with eight roses azure, seeded proper. charged with a lynx head cabossed argent. in chief a label throughout counterchanged. vested and wearing a mail collar argent. a lute and a falchion inverted proper and in chief a seagull displayed counterchanged. 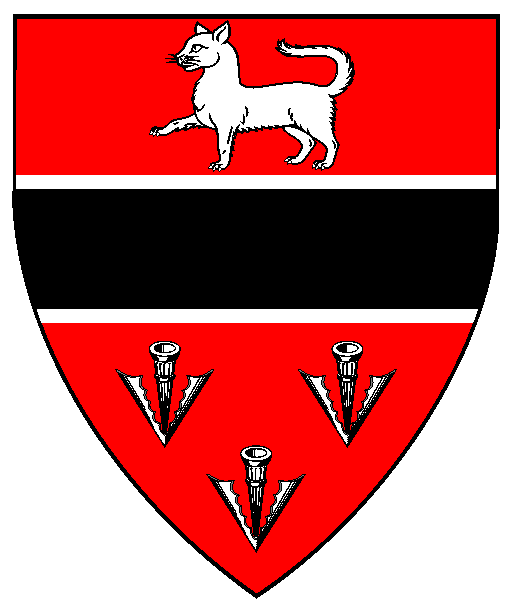 statant erect proper, grasping in its dexter forepaw a sword argent, hilted sable. BADGE: Argent, vêtu ployé, a fret azure. BADGE: Per pale azure and gules, a cinquefoil erminois. Or, a cross cotised between in bend two lions rampant to sinister sable. Vair, a griffin segreant gules, a chief argent. a lute affronty and in chief two thistles, all counterchanged. its dexter foreclaw clutching its tail, argent. and a goutte de sang, a needle, point to base, argent. 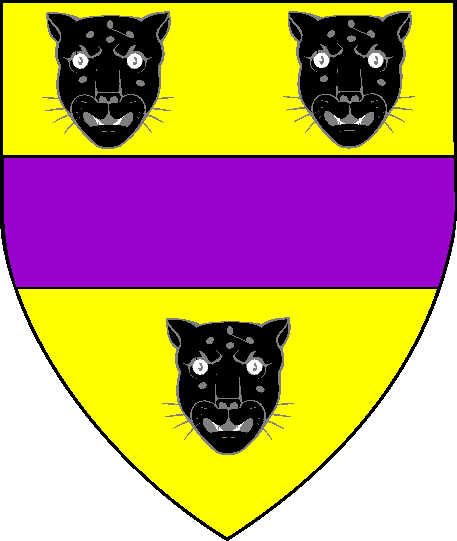 Argent, a tree blasted and on a chief purpure, two urchins statant respectant argent. 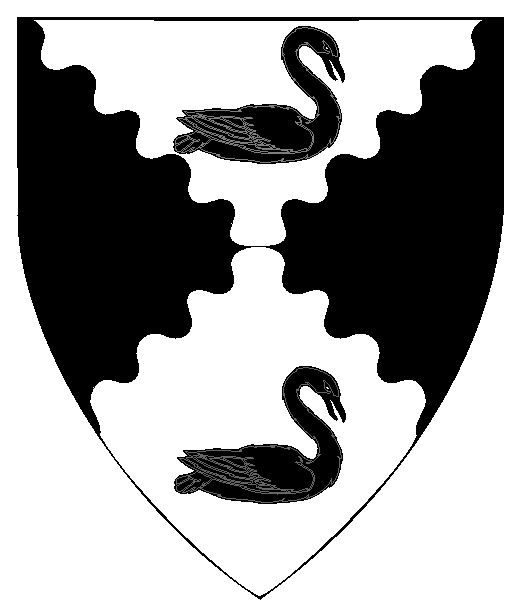 on a chief embattled sable, three harps argent. a garden rose reversed, sable, slipped and leaved vert. Per fess Or and sable, a sun and a lion's head, erased and sinister facing, counterchanged. Per saltire wavy argent and sable, two swans naiant contourny sable. and a bear paw fesswise argent. Gules, a chevron embattled Or, overall a pegasus salient argent. Azure, a fess wavy and in chief a roundel argent. Sable, a fox rampant within an orle Or. a sea-serpent ondoyant and issuant from the line of division azure. Per chevron ployé sable and gules, two musimons combatant and a Norse sun-cross argent. Argent, a fess nowy azure charged with a plate. a chief wavy checky azure and Or. Badge: Per chevron azure and vert, a mushroom erminois. 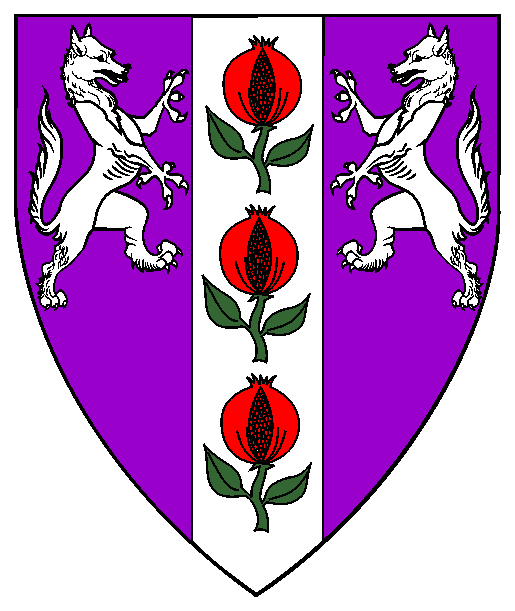 Purpure, on a pale between two enfields combattant argent three pomegranates gules slipped and leaved vert. 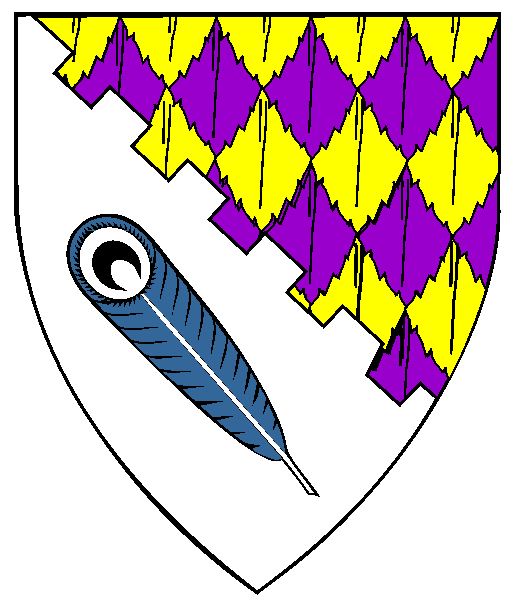 Per bend embattled plumetty Or and purpure and argent, in base a peacock's feather bendwise azure. Argent, in pale a domestic cat sejant vert and an anvil sable. 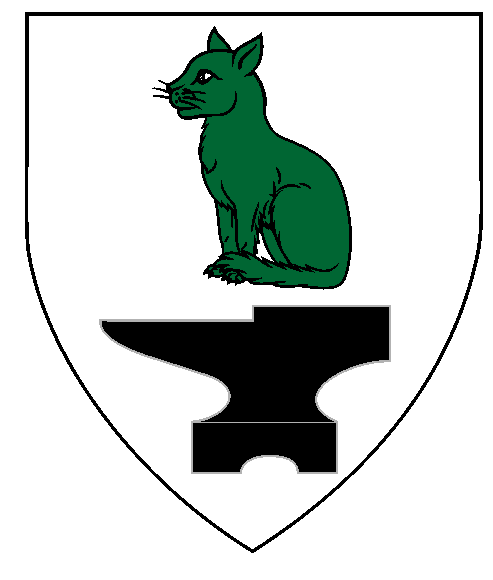 Badge: (Fieldless) Atop an anvil sable, a domestic cat dormant vert. Gules, a fess sable fimbriated between a domestic cat passant and three pheons argent. 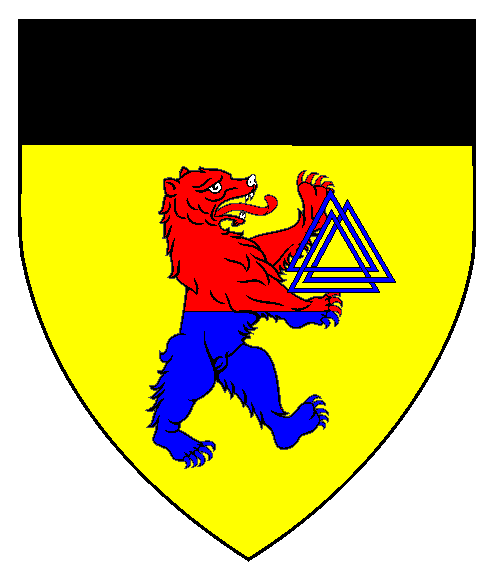 Or, a bear rampant contourny per fess gules and azure maintaining a valknut azure, a chief sable. 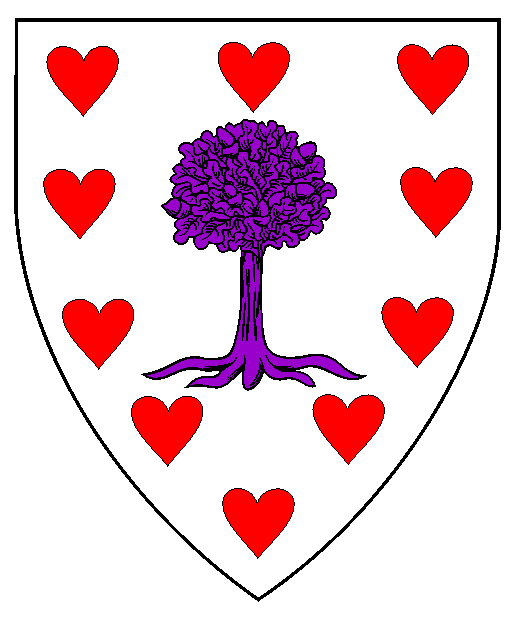 Argent, a tree purpure within an orle of hearts gules. 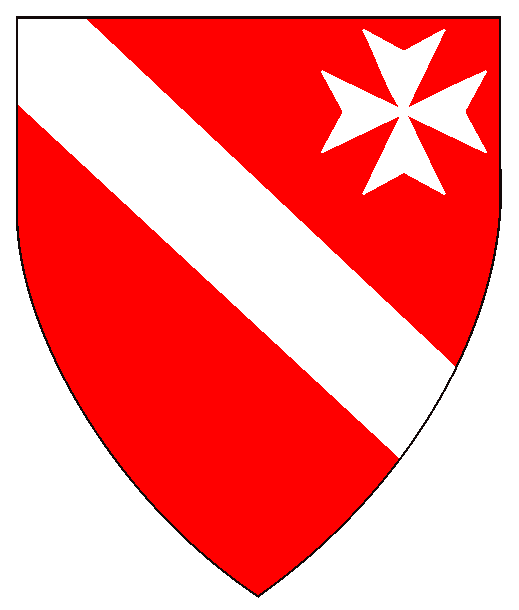 Gules, a bend and in sinister canton a Maltese cross argent. Court Baroness July 21, LIII (2018) by Sean and Sigrid of Artemisia, via Uther & Kára of the West. 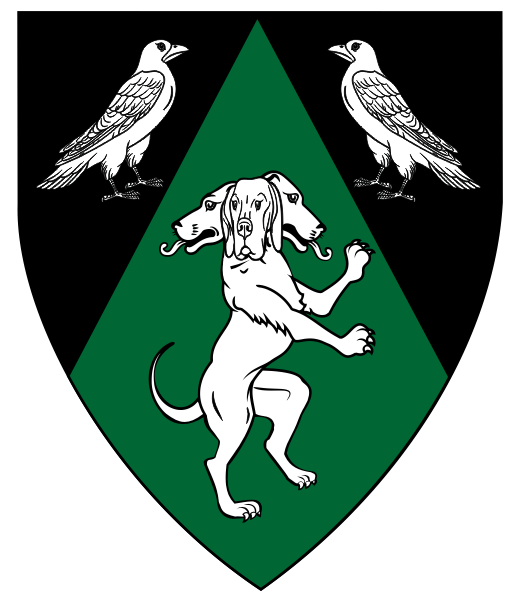 Per chevron throughout sable and vert, two ravens respectant and a three headed dog rampant contourny argent. a member of the Canton Ynys Taltraeth. Some artwork provided by owners of arms depicted. Most artwork on these pages created with CorelDraw!3-9 by Khevron.